Negative Inventory Warning on the Vend Sell Screen – How can we help? 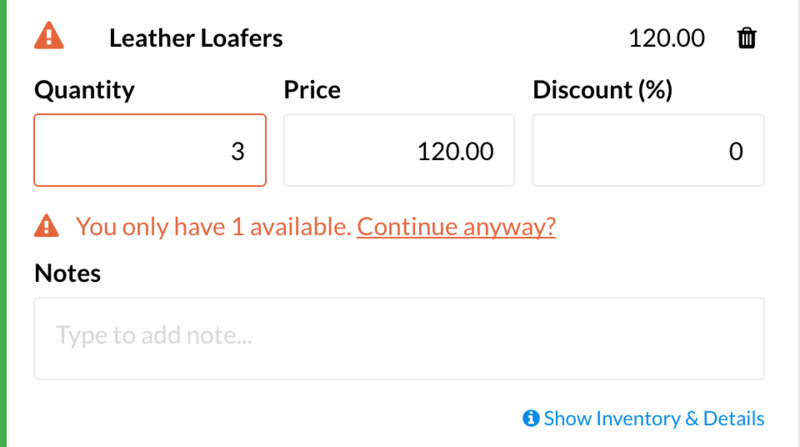 To enable or disable the negative inventory warning in your store head to Setup -> Outlets & Registers and click Edit Outlet against the outlet(s) where you'd like the warning to appear. Once here, navigate to the Sell Screen Prompts section, tick negative inventory and save this outlet. How does this appear on sell screen? Each time you add a product to the sell screen, Vend will check the products stock levels in the background. When the quantity of a product being sold exceeds the amount of available stock for this product, you will receive a warning message on the sell screen. At this point, you will need to take one of two actions. Your first option is to remove the product from the sale and continue as normal. The second option is to click continue anyway. This will let you sell this product even though you do not have the stock available in Vend. You might do this if, for example, there is a discrepancy between your shelf stock and your inventory in Vend. If you don't take one of these two actions, you will not be able to click the pay button and process the sale.